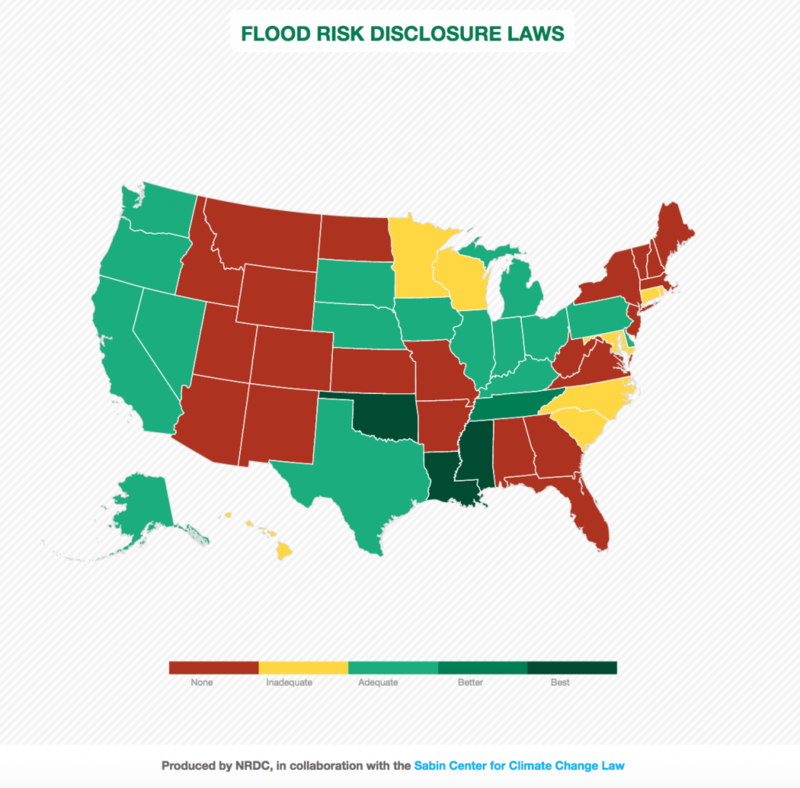 New research from the Sabin Center for Climate Change Law and the Natural Resources Defense Council (NRDC) reveals that nearly half of states do not have regulatory or statutory requirements for sellers to disclose a property’s history of flood damages to a homebuyer. As a consequence, many homeowners may never learn their home is vulnerable to flooding until after they find their homes quite literally underwater —a risk that is increasing alongside sea level rise and more frequent and intense extreme weather events. Ironically enough this information may be readily available either from the seller or from the Federal Emergency Management Agency (FEMA), which keeps a record of flooding in all properties which receive insurance through its National Flood Insurance Program (NFIP). Is your state one of the many that keep homebuyers in the dark about whether their new property is susceptible to flooding? The Sabin Center and NRDC reviewed all 50 states’ real estate disclosure laws to put together this interactive map identifying the robustness of each state’s requirements. Twenty-one states lack statutory or regulatory requirements for sellers to disclose a property’s history of flood damages or other factors related to flood risk. The other twenty-nine states, plus Washington, DC, at a minimum, require sellers to disclose whether the property is in a designated flood plain before the point of sale. Of these, only ten states additionally require disclosure of whether there have been any flood damages to structures on the property. Inadequate disclosure laws have real consequences in a world where flooding is an ever growing risk for many communities. In 2017, more than 95,000 NFIP policyholders submitted claims to FEMA for about $8.7 billion in damages—the third highest damages payout since 1978. The top three most expensive claim years have all occurred within the past 15 years. As climate change contributes to sea level rise, storm surge and more extreme precipitation events, these numbers stand to escalate—a recent report from the Union of Concerned Scientists shows that sea level rise will put hundreds of thousands of homes at risk of chronic flooding over the coming decades. FEMA should provide homeowners a “right to know” about their property’s past history of flood insurance coverage, damage claims paid, and whether there is a legal requirement to purchase flood insurance because of past owners’ receipt of federal disaster aid. FEMA should create a public, open-data system to share information related to flood damage claims, number of repeatedly flooded properties, and whether communities are properly enforcing local building and zoning codes required under the NFIP. As a condition of NFIP participation, states should adopt comprehensive flood hazard disclosure requirements for real estate transactions that provide home buyers a right to know about a property’s history of flood damages, whether the property is required to be covered by flood insurance, and whether the property is located in a flood zone. These measures would help ensure homeowners have the necessary information when making one of their largest financial investments and more broadly help break the cycle of investment in properties increasingly vulnerable to flooding. In the absence of federal action, states can also amend their laws to require sellers to disclose these critical pieces of information. While Florida does not, according to your article, have laws regarding flood hazard exposure, FEMA and individual counties do provide flood hazard information. (https://msc.fema.gov/portal/search). Additionally, people trying to obtain property insurance in Florida usually are advised by the insurance agency that they need flood insurance.